This fort is not, as the Marathi name suggests, very simple to trek. G. N. Dandekar, one of the greatest historians, writes about the fort, �We have to climb the cliff on eastern face of the fort by catch-holding one tree.� The fort lies in between the forts, Rasalgad and Mahipatgad. This fort is covered by dense forest and also has a difficult route to climb. This may be the possible reason that the fort has lost its familiarity among the trekkers. On reaching the fort-top, we come across two cisterns. A cave has been carved inside these cisterns. There is a �Shivalinga� and an idol of a goddess in this cave. Heading further to the right of these cisterns, we come across a cistern supported on only one column. From here, one straight way climbs up the hill, while the other stretches around the hill. While traversing around the hill, a cave is seen, which has now been clogged by rocks and soil. There are two rooms inside this cave. The fort can be approached either from Rasalgad side as also from Mahipatgad. The paths from both sides unite at a col from where fort-top can be reached. One has to descend from opposite side of Wadi Beldar from Mahipatgad. We come across a settlement of shepherds on this way. 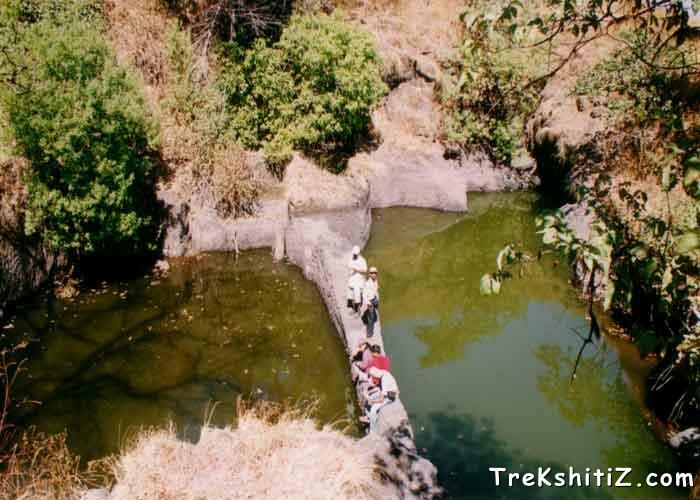 After crossing a stream on our way we have to climb up a hillock. Within half an hour we reach in the col. The way on the left leads us in the direction of the fort. Proceeding through this path we come near a precipice. From here the way ahead to the top is slightly difficult. Use of rope is preferable for safety reasons. About 2 � hours are required to Sumargad via Mahipatgad. A foot-track from Rasalwadi, via a settlement of shepherds on a hillock, leads up to the col. Here we cannot miss to visit Raya�s (a helpful shepherd) hut. Moving further from here we come across a stream and a water pond which is suitable for drinking. Further moving through the �Karvi� bushes we reach up to a rock which can be climbed up with the use of rope up to the fort-top. Otherwise a straight route leads us to the col from where fort-top can be reached. About 4 � hours are required to reach Sumargad from Rasalgad. There is no residing place (shelter) on the fort. Perennial source of water is available on the way to the fort. About 2 � hours via Mahipatgad. About 4 � hours via Rasalgad.